This elegant cutlery set from our Vintage tableware collection consists of 10 pieces, all made of high-quality 3mm stainless steel with a matte and aged finish and an added vintage accent. Find out more on Supreminox.com. This Vintage collection professional cutlery set includes a tablespoon, dessert spoon, mocca spoon, table fork, lunch fork, dessert fork, table knife, dessert knife and a steak knife, all made of high-quality stainless steel. Its round and simple design make this cutlery a versatile and universal piece of a professional tableware. This 18/10 stainless steel cutlery is dishwasher safe. Comes in a pack of 120 units. 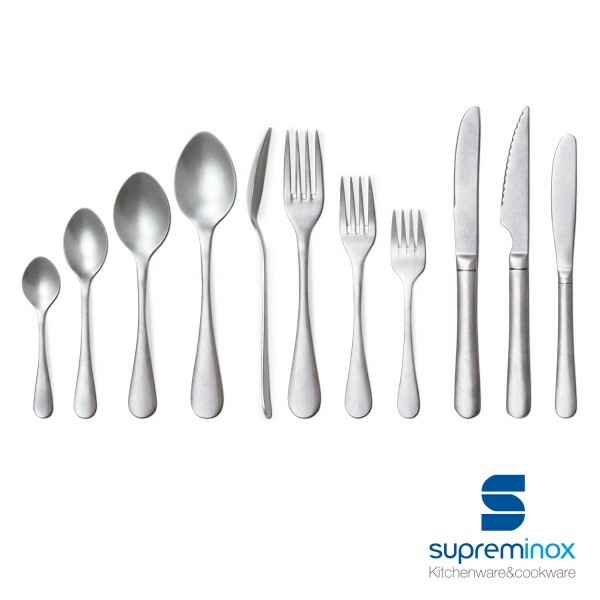 Discover more about our Vintage cutlery collection on Supreminox.com. Order online here.